The poverty spirit causes us to see ourselves as less than God sees us. This album explores healing from this spirit through the grid of Scotland’s history. This album was released in 2018. My American culture is a lot about getting. And yet in spite of all of our consummate getting, getting this, the wisdom to see ourselves as God sees us, seems to elude so many of us. A framework for us to begin see ourselves more like God sees us - that is what is communicated here. I am stepping out in some new things in the last few years, and like Peter, finding it’s tough out of the boat, in the rain, on the water. I need to let some old perspectives go, some things that have been a comfort but are keeping me small. 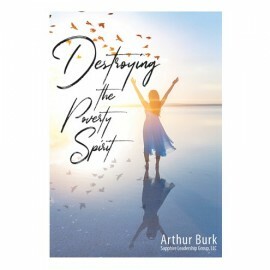 Arthur speaks like no one else to those of us wanting to more align with heaven's design and to move above/beyond the glass ceiling imposed by our culture, family, and religious rituals. I highly recommend! The content of this teaching is impressive, informative and revolutionary in many ways. The content will inspire a beautiful revolution, a beauty revolution. But that is not what I found most compelling and inspiring. I most appreciated the way Arthur Burk delivered this message. Not his clever choice of words, but his heart behind it. His way of loving and respecting the country and the people he addressed. The WAY he spoke of Aberdeen, the WAY he spoke to the mom with grit, it is all a labor of a heart full of love. It made me think of the love needed in 1 Cor13 :1-2. In this teaching I heard Love, I heard Him, loud and clear. And THAT is inspiring. I’m sorry I missed this live event. This was a good one! This may be exactly what I needed to get me back on track. A poverty spirit is not about money. King Saul was wealthy, but had a poverty spirit about the throne. Our poverty spirit will help us convince ourselves not to do what God has called us to do. It can always find a way to explain why it is right for things to be wrong. Fortunately, we can overcome the poverty spirit in our lives.